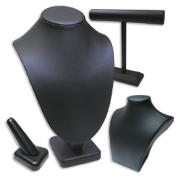 Shop our high-quality Black Leatherette Displays section and get the classic look for your collections! Find elegant pieces for showcasing your earrings, bracelets, rings, necklaces and other precious items. Discover busts, trays, stands, T-bars, pillows & even watch boxes, all at affordable discount prices thanks to our wholesale offers!